Lavender essential oil is one of those natural oils that has such a unique, fresh and at the same time very characteristic smell as well as so many uses that you may end up using it all the time one way or another. Due to its aromatherapy smell, you can use it on your pillow to relax you before sleeping, in your essential oil diffuser, as an air freshener or even in your closets to make them smell great. Lavender oil has a lot of other uses which include relieving muscle and joint pains, repelling bugs and even helping to deal with hair loss. You can also mix it in skin and hair care products such as lotions, shampoos or conditioners but if you want to use it directly on your skin, it is always better to dilute it in a carrier oil and even then, you should perform a patch test before. In general, lavender oil can be strong for the skin especially if undiluted. 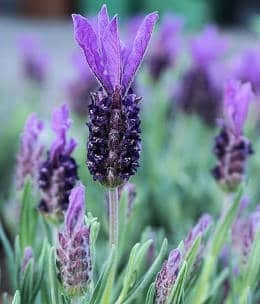 Lavender oil’s aromatherapy uses makes finding the best smelling lavender essential oil necessary, so in this review we have written about some of the best brands of great smelling lavender essential oils and the reviews that people share about them. When using this aromatherapy oil, there are also some precautions you need to be aware of. For example, it should be avoided by pregnant or breastfeeding women. For more precaution tips and personalized advice, you should consult a licensed aromatherapist. 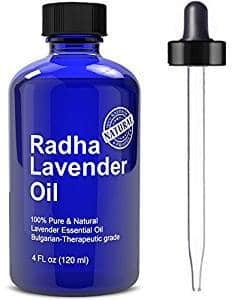 This 4 ounce blue bottle of Radha Lavender essential oil is a pure Bulgarian lavender oil which is used for aromatherapy. Bulgarian lavender has a slightly stronger and different scent than French lavender. This essential oil can be used for aromatherapy in baths and diffusers, and is also great when used as a massage oil. It comes with a money back guarantee. Ratings and reviews for this product are really good. Users feel that it works well in soap making and helps relieve headaches and relax tense muscles. They also state that this is a great smelling essential oil and when used in a diffuser, it freshens their entire house or apartment. 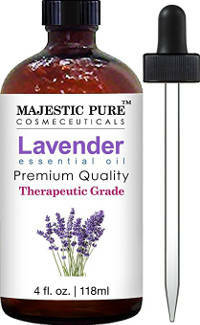 This Majestic Pure Lavender Essential oil comes in a 4 ounce amber bottle with a dropper. This Bulgarian lavender oil is not edible and is considered to be fairly strong and concentrated. Consumer ratings and reviews are very positive. Users find that it has a great scent which is more fresh than flowery. It is relaxing and use it added to skin care products, laundry detergent and insect determent. Some users also spray small amounts of it on their sheets for a better night’s sleep and say that it helps to relieve muscle pain. 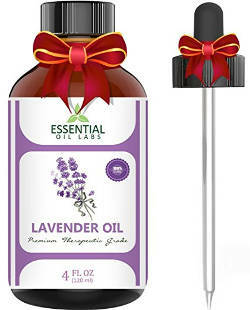 This Now Foods Lavender Oil comes in a 1 or 2 ounce amber bottle with a dropper applicator. It is 100% pure and natural and has a clean light scent and texture. Its aroma is also described as calming and soft. Although this lavender oil is sold by Now foods, it is not recommended for internal use. Consumer ratings and reviews are extremely good. Users love the scent of this oil and find it able to calm anxiety and ease tension. They also like to use it in homemade bug repellent and find that it relieves itching from rashes. It is also easy to add to body washes, shampoos and moisturizers. Edens Garden creates a really remarkable variety of top quality essential oils. 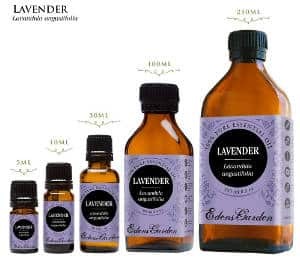 This Edens Garden Lavender Essential oil is a certified therapeutic grade essential oil available in 5, 10, 30, 100 and 250 ml ambler glass bottles with euro style dropper caps. When you order it, you get a brochure containing 150 different ways of using essential oils, and is good to know that 10% of all the company’s proceeds are donated to various organizations. User reviews are exceptionally good with users liking its scent. They state that when added to their laundry, it smells fresher and they also use it as a room freshener, insect repellent, pain reliever as well as stress reliever. When used in the bath, people feel that it helps them to relax and sleep better. They also like the way it smells in homemade shampoos and skin care products. In addition, they use it to heal scratches and bug bites. This Plant Therapy Lavender Essential Oil is a high quality product that is completely free of additives. It has a floral scent that feels fresh with a light balsamic woody tone. This versatile essential oil is sold at an affordable price and according to the company’s info, it is made from lavender plants that are grown at a high elevation of over 3,500 feet, which makes this oil smell exotic and complex. Some users describe the smell of this brand of lavender essential oil as heavenly. They also mention that it smells strong when you open the bottle but when you dilute it in an oil warmer or diffuse it, it smells like a garden of English lavender flowers. 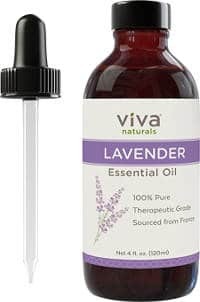 This Viva Naturals French Lavender essential oil comes in a 4 ounce amber bottle with a dropper. It is steam distilled and aromatherapy grade. Its aroma is described as floral, fresh and full-bodied. User ratings and reviews are very good with users liking the fact that this product leaves behind no residue when sprinkled on the sheets for a good night’s rest. In addition, it is clean smelling and works great in homemade laundry soap, body moisturizers, hair and hand creams as well as facial cleansers. They also like the light, but clear scent of this lavender essential oil and find it quite relaxing when used in a room diffuser or bath. 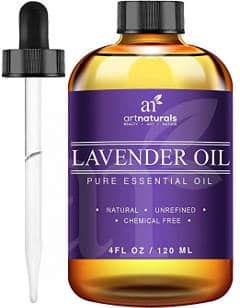 This ArtNaturals Lavender essential oil is a natural and unrefined Bulgarian lavender essential oil that is nice to be used in a diffuser and even a humidifier or vaporizer to create a great smelling aromatherapy mist. Users like the scent of this oil and find that it reduces stress and anxiety while also helping to induce sleep. It relieves headache and is great in the bath. In addition, it is easy to add to skin care products, shampoos and laundry detergents, and is great when sprayed on freshly launder bed sheets. 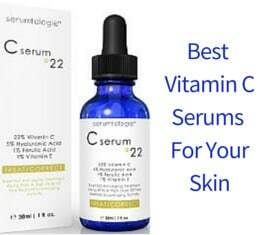 People like that it is available in a handy travel size bottle as well as a larger bottle for at home use. 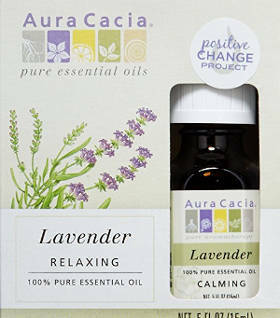 Aura Cacia has been a well established company in the world of natural products since 1982 and their essential oils are well known to have a very good quality. This Aura Cacia Lavender essential oil is sourced from Ukraine and created by steam distilling the lavender flowering tops. According to the company´s description, it has a balanced and gentle sweet floral aroma with notes of herbs and sweet hay. Users are well aware of the reputation of this company and very satisfied with this product. 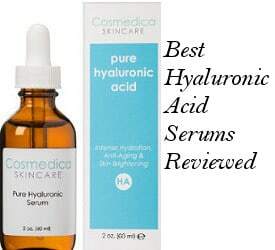 They review that it has a great consistency and a beautiful lavender scent. Nevertheless, few people found its scent a bit weaker than other lavender essential oils they have used. 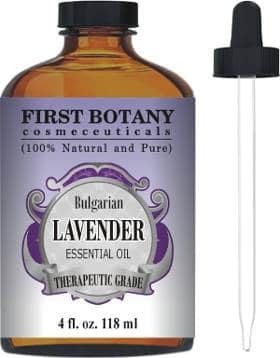 This First Botany Cosmeceuticals is a Bulgarian essential oil that when compared to the French lavender for example, it has a smoother, sweeter and less camphoraceous scent. It also has a slightly deep note and smells fresh. It can be nicely blended with other essential oils. The Bulgarian lavender plants are grown in low altitudes compared to the French ones that are grown in high elevation areas and that’s what makes the smell of Bulgarian lavender oil a bit different than that of French lavender oil or others. This product is sold at a large size bottle (4 oz.) and has a glass dropper. It also comes with a 100% guarantee. 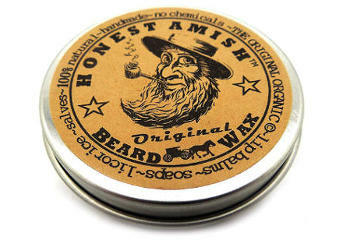 According to users´ feedback, the smell of this product is strong, natural and it lasts. It is also refreshing. doTerra is another company that creates good quality essentials oils and their Lavender essential oil should not be an exception. People review that it smells beautiful like pure lavender and has relaxation and other therapeutic abilities. So, users are pleased with both its scent and effectiveness. This lavender essential oil by Essential Oil Labs is sourced from sustainable farms, it is steam distilled and free of chemicals and additives. It also comes with a satisfaction guarantee. People describe its smell as fresh and herbaceous but not everybody is pleased. There were few users that found this product not as potent as other lavender essential oils they have used since they had to use a lot more drops of this oil in their diffuser to get the aromatherapy lavender scent that they are used to enjoying with other lavender oils. This lavender essential oil sells at a good price but there seem to be mixed reviews about its aroma. While some users say that its smell lasts long without being overwhelming, most others think its smell is not particularly strong or potent compared to other lavender essential oils they have tried. There were also few negative reviews relating to the consistency of the company in batching this oil. In conclusion, if you are looking for the best smelling lavender essential oil, here we have selected some different options that are top reviewed both for their amazing smell as well as therapeutic features in most of the cases.